Modifying tumour cells from malignant liver cancer so that they shine brightly under specific conditions might seem like a neat trick. That is until you realise that this will not help diagnose, detect or eradicate cancer in people. Instead, these modified human cells are destined to be injected into a mouse, to generate a huge tumour inside the animal. Researchers want to see where the tumour is, so they can accurately measure the size as its growth continues – unchecked and untreated – until they decide that the experiment is over, and the mouse is killed. The pictures show lines of mice, after their fur has been shaved at the tumour site on their sides. At the top of the images you can just make out that their faces are rammed into plastic tubing delivering anaesthetic gas. 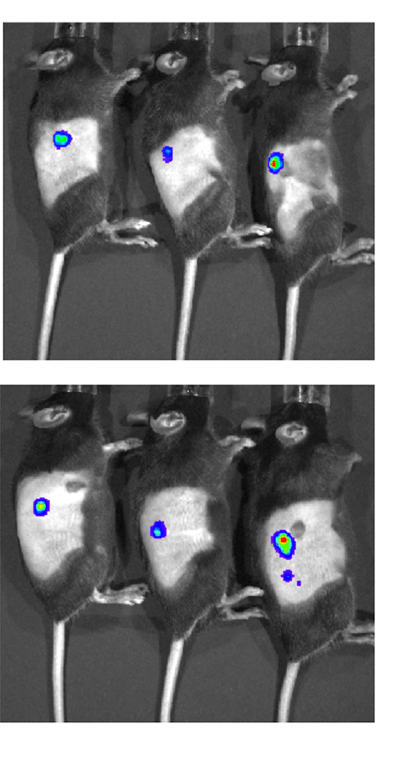 The tumours are falsely coloured here so that they appear blue, green and red, but would glow yellow when the mice were put in specialised imaging equipment. These mice would have undergone the imaging procedure every 2-3 days after they were injected with tumour cells, so researchers could monitor the increase in volume of the growth. Surprisingly, uncontrolled tumour growth is not the focal point of these tests. Instead, the mice are part of hugely expensive research efforts to create a ‘small animal model’ of hepatitis C infection, as a basis for testing potential treatments. Hepatitis C is a virus that targets the liver in people. It is a serious health problem globally, with 71 million people living with chronic hepatitis C at the end of 2015, according to the WHO, plus 1.75 million adults newly infected in 2015, and a death rate comparable to that of HIV. For people, infection with hepatitis C tends to be via injections into the blood – e.g., IV drug use with unclean needles, or contact with contaminated blood products. The chronic form of the disease persists for years and results in liver cancer (hence the cancer cells injected into mice) and cirrhosis, which are ultimately fatal. However, researchers can’t just inject mice with a hepatitis C virus-contaminated needle to produce a ‘small animal model’ for testing, because mice are not naturally susceptible to hepatitis C. As with many other attempts to use animals as models of human disease, this means that various genetic modifications are necessary to make mice vulnerable to hepatitis C infection. In attempts to create models of hepatitis C infection (which have yet to successfully mimic the full disease as it occurs in people), researchers alter the genes of mice to give them the human genes responsible for viral entry to the liver, creating so-called ‘humanised’ mice. Researchers also have to disable the animals’ natural immunity to the virus so the mice can be infected, which may result in one gene or several genes being ‘knocked out’ or removed. The resultant immune-deficient mice could then be bred with other mice with different mutations- e.g. a mouse with a ‘detection system’ added to enable estimation of the extent of the infection, or a mouse with the genes for a fatal liver disease. Despite the increasing complexity of these mouse ‘models’ of hepatitis C, none successfully mimic the full disease as it occurs in humans. We can, and must, do better. For one, we need to go back to the virus itself. 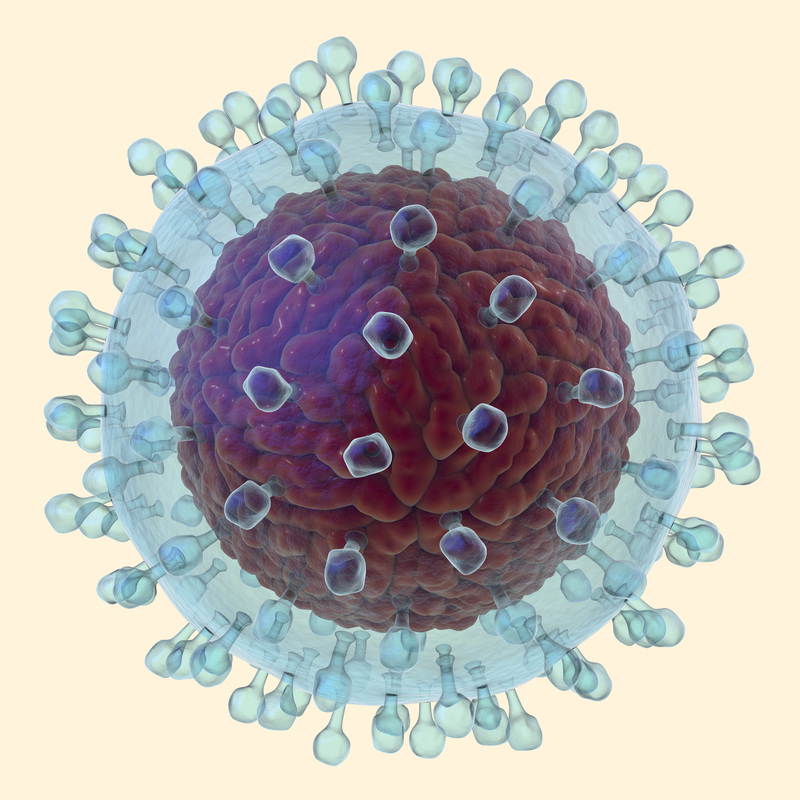 The hepatitis C virus has developed many cunning strategies to evade detection in the human body, so a clearer understanding of what these are, and how some people naturally get rid of the infection within a few months, may help to work out the virus’ weak spot(s). Use of human cell culture systems to propagate the virus has meant that infectious viral particles can be produced. This is important as the hepatitis C virus has a high mutation rate, constantly altering its surface and therefore complicating the development of a vaccine. A careful analysis of viral particles could identify differences in the strains and help to work out possible targets for neutralising and eliminating the virus. Some of the features that make hepatitis C such a challenge to treat – its variability and capacity for staying hidden in the body for years – cannot be addressed by infecting animals, no matter how many human genes you add to them. Disease prevention is a more straightforward and effective strategy, e.g., improving hygiene and needle disposal after health care injections, screening blood products prior to transplantion, improving health practices in countries that require more support, and harm-reduction services for intravenous drug-users. In Australia and New Zealand, the introduction of a public health approach that provides sterile needles has prevented 21,000 cases of hepatitis C infection in the drug-using population. A project in the UK is using advances in genetics to sequence both the virus and the infected patients to identify how different people respond to the distinct strains of the virus. The data, collected from 10,000 individuals, can also be used to develop predictive models that are likely to lead to better treatment strategies. It is important to look at both the virus and the patient, as infections are personal – some people can shrug off an infection that becomes chronic in others – mainly due to differences in our genes and how they are regulated. A recent study has also shown that susceptibility to hepatitis C infection depends on cell maturity and could be used to look for the cellular factors that are crucial for infection in people. Examining how and why these infections take hold and persist in people may do more to reduce the incidence of hepatitis C than continuing to genetically alter animals. 4.-6 events of bleeding both red and black. I give to any researcher interested my lab tests, blood, urinary and soundecho. I wanna know how has evoluted my desease. Perhaps this would be of interest to you?